Inulin soluble vegetable fiber, stevia leaf extract. 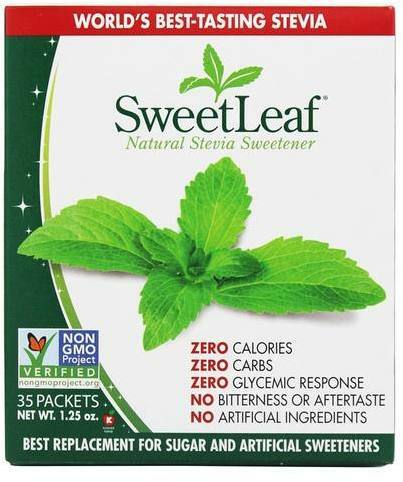 Enjoy SweetLeaf Sweetener® in your favorite hot or cold coffees, teas, lemonade or any beverages. It is great sprinkled on hot or cold cereal or mixed in pies, puddings, or other desserts as well as yogurt, muffins and cookies. It's delicious on berries or any fruit. 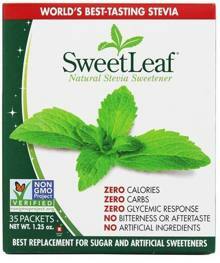 SweetLeaf Stevia Sweetener begins with the highest quality stevia leaves from nutrient rich soils. The leaves then release their sweetest compounds during gentle processing with only cool, pure water. The result is pure sweetness with zero calories, zero carbs, zero guilt and 100% great taste. The unique SweetLeaf method provides farmers a way to earn a fair and safe living and is a completely natural, sustainable, green process from start to finish. From plant to process to product, SweetLeaf Stevia is the sweetener you can actually smile about in every way. Well-suited to every diet, SweetLeaf is 100% natural and contains no chemicals or alcohol residue to create an unpleasant aftertaste. Sweetness as nature intended.